Tot School | Tired, Need Sleep. My first Tot School post! I have read Carisa's blog daily for over a year now and it has been incredibly inspiring to me. I've been doing what she calls "tot school" with M for quite a long time, and one of the decision makers about whether or not to start my own blog was the fact that I was just so darn excited to be able to share what we do for our tot school time together. 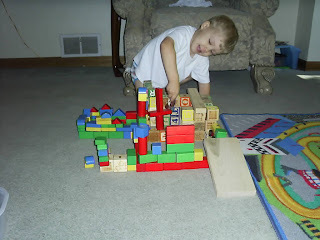 We played with blocks a lot, building houses for his little action figures. He has really been into blocks lately, which I love to see. We did our foam number puzzle. He hammers the numbers in while I tell him what they are. He really is not into numbers right now, so I keep trying to get him interested. Usually anything involving a hammer will catch his attention. 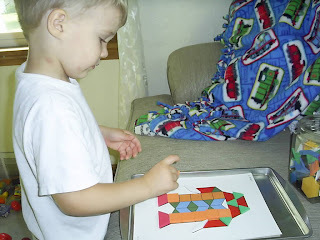 We got this idea from Carisa, who does it with her tot with a foam ABC puzzle. 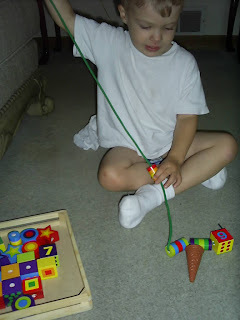 We worked with our Melissa and Doug Lacing Bead set. 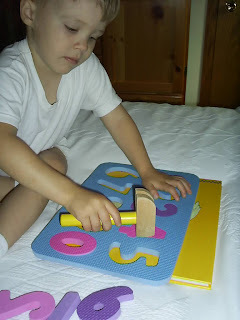 I tried showing him how to make a square, circle, square, circle pattern, but again... he was not all that interested. He did learn the word "cylinder" though! We also played a lot of bingo. 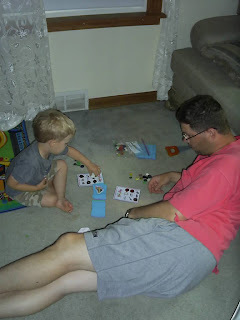 This is a picture of him playing it yet again with Daddy, giving me a break from all the bingo (we really have been playing it a lot). I printed the set out from this site, and we use buttons for markers. 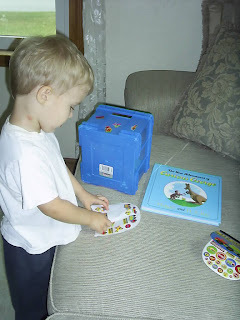 It's great for learning to take turns, counting, and to develop vocabulary. That's it for this week. For more tot school ideas visit here! He is quite the little builder with his blocks:-)!! What an awesome week! I'm happy to see another mom who wants to share her great ideas with the rest of us. His building skills are quite impressive! Thanks for sharing. Welcome to officially posting with Tot School!!! What a fun week!! Love how much he is into BINGO!! LOL! We haven't tried bingo with M yet, I'll have to do that since it looks like so much fun. Thanks for the link! I have met your blog through Tot School and your comment on my entry. I love to read about what other tots Anna's age are up to. 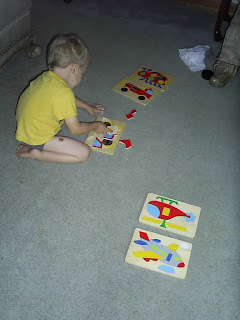 I wanted to ask - where did you get those puzzles with planes and other vehicles? I would love to get something like this for Anna - they look just about the right level of difficulty for her. Raising a Happy Child - I got those puzzles at a sale at our community center. They were originally used for some of the preschool classes. They are really great, with more pieces than it looks. I'm sorry I can't be more help... I don't even know who makes them as there is no information or labels on them. Maybe look on Ebay? Good luck! Thanks for stopping by!